Welcome to Second Chance Tuesday! 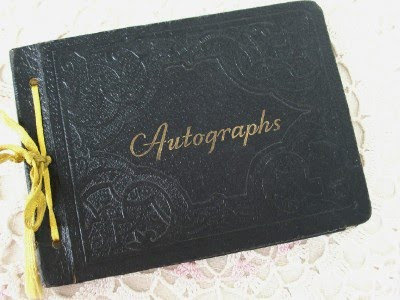 Today I'm showing one of my favorite vintage things to find: an old autograph book. 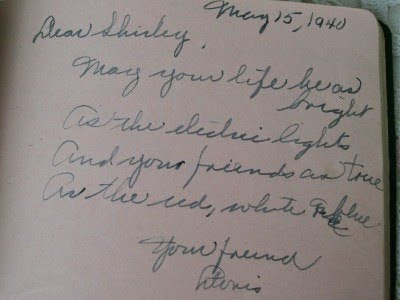 The old hand writing and vintage sentiments are so much fun to read. I just found this book from 1940 and alas, it has sold already before I could write my post about it...but luckily I took pictures of what I considered the best sayings. As the red, white, and blue. 'as bright as the electric lights?' That's funny. My one and only autograph book has very few writings inside - but it's still neat looking. The sayings in those old autograph books were so cute and innocent. I love to find books based on old diaries too. Good Second Chance today! and thinks it shredded wheat.